Day 209: Ain’t Misbehaven . . .
Today some of our best friends landed in Argentina for two weeks of searching for the perfect Malbec. Have to admit, wish we were with them . . . oh, the trouble we could get in to – on, second thought . . . perhaps it’s best we are not there. Those that know these two know they are quite capable of misbehaving all by themselves – we might just complicate the situation. One of these days, we hope to hop on a plane and head to Argentina ourselves, among other places – but for now, will let our friends enjoy the adventures and return to us with samples and stories of their travels. So, tonight in honor of these worldly travelers, we opened a wine that unfortunately one can only purchase at the winery – “sorry about that Chief” – there it is another classic TV show line. 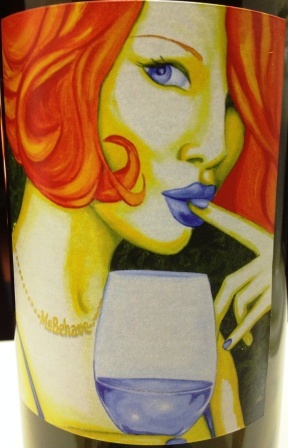 Anyhow, back to the wine – – tonight we popped the cork on a 2010 Ms Behave Malbec from Peachy Canyon Winery. Peachy Canyon is on the “favorite list”. We have been to this Paso Robles winery twice and have yet to be disappointed with their offerings. A trip to Paso is incomplete without a stop by Peachy. The wine itself is a deep, ruby-red color that wants to just jump out of the glass. At first sniff we were a bit complexed – – – the nose was rich and nutty with hints of oak and white pepper but tossed in with black cherry and vanilla – a real “soup kitchen” of amoras. On the palate, it slipped into notes black cherry flavors with a hint of blackberry. The finish is quite dry and sticks around on for quite some time – more roasted nuts and citrus zest, like a great espresso. The espresso is a game changer – it just hangs on forever and ever. This was truly a “deck” wine – we are saddened by the fact that there is a burn ban in effect – otherwise, we would fire up the pit and sit around it while enjoying this spectacular wine. We pray for rain – and the opportunity to “light our fire”. As mentioned earlier, one can only order this wine at the winery or via their website – a bit pricey . . . by oh, so worth the price. So tonight, we won’t linger. As we head into three special days in the Church, we will say a prayer or two for all of you and can’t wait until Easter Sunday and the Resurrection! Just love this time of year – even though we know the story, and the ending – it is a wonderful time to be alive and a member of any faith community. Easter blessing to one and all! Please remember to enjoy responsibly and recycle whenever possible! Categories: Uncategorized | Tags: Easter, Ms. Behavin red wine, peachy canyon | Permalink. Wishing you were here too!